1. Taking bilingualism to the bank: In the Economist, bilingualism comes down to dollars and cents in, What is a Foreign Language Worth? The article looks at actual ROI (return on investment) for bilingual employees. While these numbers are lower than others comparisons we’ve seen, we found it interesting that you can expect being bilingual in German to increase your lifetime additional earnings by nearly three times that of Spanish. Will Goethe become more popular with the preschool set now? 2.Little Pim in the News: Our own Julia Pimsleur Levine, founder and CEO of Little Pim, is featured on Forbes this week in How to Speak Entrepreneur Like a Native. If you’ve ever wondered how Little Pim started, this is a great read. If you’re interested in hearing from Julia first hand about her entrepreneurial endeavors, her personal Forbes blog is here. 4. “Hear and I forget, see and I remember” – National Geographic explores why it’s easier to remember new lessons, including a second language, when you use visual and tactile lessons---like Little Pim’s videos and books---and not just audible ones. 5. Say what? According to a New Zealand study, babies can actually make distinctions between words spoken in foreign languages. Who’s the Smartest Person in the Room? The Answer May Surprise You. Read the full, fascinating story, here. If we parents are conflicted about how our young kids interact with technology – from Tablets and DVDs to iPhones, iPads, iPods and iDon'tKnowWhatElse – who can blame us? Not Hanna Rosin, who writes compellingly in The Atlantic this month about the plugged-in push-pull parents face. Back in 2006, notes Rosin, 90 percent of parents said their children under 2 used some kind of electronic media. With over 118 million tablets sold in 2012, imagine how high much higher that number must be today. The reality is our kids are exposed to technology every day. Rosin dubs them "the touchscreen generation," and explores the theory that banishing technology outright may be a simple, if dramatic, response, but perhaps not the most appropriate one. Maybe, she posits, technology – especially today's interactive technology - can be beneficial to our children. “People say we are experimenting with our children,” Sandra Calvert, director of the Children’s Media Center at Georgetown University, told Rosin. “But from my perspective, it’s already happened, and there’s no way to turn it back. Children’s lives are filled with media at younger and younger ages, and we need to take advantage of what these technologies have to offer." If we adults use technology not just to entertain, but also to enrich and educate ourselves, as you are doing right now, how can we help our children do that as well? 1. Content: "Think about the content of what your children see on screen." Programming or technology that is age-appropriate – designed for and directed to children -- and encourages the children to interact with what they see onscreen – by asking open-ended questions, for instance – may engage children more. 2. Context: "Think about the context -- who is with them, how are they talking about what they see, how much the DVD or online game dominates their day." Studies show that when parents sit with their young children as they watch and talk to their children about something that they are watching or experiencing together, they are enhancing their children's language-development readiness. One study showed that verbal media interactions between parent and child with educational programming significantly enhanced children's language skills eight months later. Researchers compare watching a video to reading a book, in that the experience is profoundly enriched when parents ask their children questions about what is on the page and what their children think might happen next. 3. Child: "Think about what makes sense for your individual child, whose needs and interests will be unique to him or her alone." What works for the neighbor's child may not work for yours, and vice versa. The technological landscape our children have been born into is not likely to go away. Both Guernsey and Rosin contend that we parents ought not to try to run from it, but rather to find ways to help our children explore it so that media can enrich their lives, and maybe even teach them something useful, like a second language! What are the three things you wish you had as a kid? The Huffington Post's Hilary Sheinbaum wishes she'd had Little Pim when she was younger. 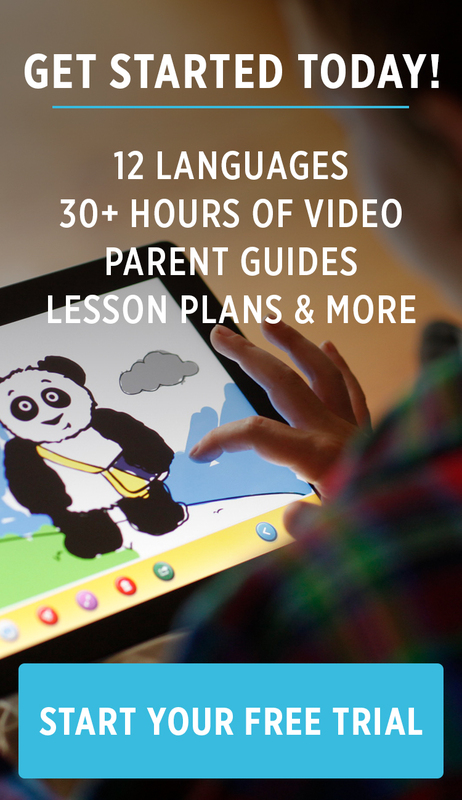 "Little Pim easily teaches young children a second language. I'm not sure if I'm more impressed by their range of available languages including Spanish, French and Hebrew (there are 10 languages total) taught with DVDs, books and flashcards, or if I'm equally inspired by the adorable (Little Pim) Panda that teaches these dialects. Had this bright bear been available during my youth, I would have been a seven-language social butterfly." "...the researchers found that at 6 months, the monolingual infants could discriminate between phonetic sounds, whether they were uttered in the language they were used to hearing or in another language not spoken in their homes. By 10 to 12 months, however, monolingual babies were no longer detecting sounds in the second language, only in the language they usually heard." Over the past decade, Dr Ellen Bialystok, a distinguished research Professor of Psychology at York University in Toronto, has shown that bilingual children develop crucial skills in addition to their double vocabularies, learning different ways to solve logic problems or to handle multitasking, skills that are often considered part of the brain’s so-called executive function. Little Pim allows families, even families who are not bilingual, to do this easily. Were you exposed to multiple languages as a child? We'd love to hear your stories! Little Pim was recently mentioned in an article on the Huffington Post about the benefits of introducing young children to a second language. "Among toddlers as young as 2 years, bilingual youngsters outscored their monolingual counterparts in the area known as “executive functioning.” To toddlers, this comes down to sorting shapes, but for older kids and adults, executive functioning includes important mental tasks such as planning, strategizing, organizing and goal-setting." Julia's Response to Amy Chua's "Tiger Mom"
A recent Wall Street Journal article "Why Chinese Mothers AreSuperior" has generated a significant amount of buzz and controversy lately (if you haven’t heard of it, you must not have talked to anyone over the age of four in the last two weeks. Go make a date with a girlfriend!). Mother and writer Amy Chua documents her hard-lined approach to parenting, forsaking playdates and sleepovers in favor of math drills and marathon music practices. The article prompted an "East vs. West" battle in the blogosphere. Author Homa Sabet Tavangar of “Growing up Global: Raising Children to Be at Home in the World” points out that we’re suddenly being presented with two polar opposite views. On one side we have mothers like Amy Chua, arguing the possible benefits of being more of a “Tiger Mom” and on the other, the new documentary "Race to Nowhere" that questions America’s culture of achievement and the negative effects it may have on our kids. So which is it? Should we be more strict and achievement-oriented, or will our children pay too high a price on a social and emotional level? As parents, we all struggle with finding a balance between arming our children with tools for future success, and pushing them to the point where they never experience the "child" part of their childhood. Whenever possible, learning for children – especially young children – should happen in a context of fun and discovery, not “shoulds” and drudgery. In the case of foreign language learning, dry teaching and endless memorization is why most Americans did NOT learn a second language in school, and bailed on that requirement as soon as they could! Here at Little Pim we are trying to make that tired learning model a thing of the past, so kids equate a second language with pandas, kids just like them, and fun games and activities that entertain them and give them the opportunity to show off those new words. At the end of the day, every parent has to choose a style of education and child rearing that works best for his or her family. These decisions are undoubtedly culturally influenced, but whatever we choose, the only certainty is that when our kids get older, they’ll turn around and tell us we should have done it differently!